"Srinivasa Kalyanam USA Premiers confirmed for Today"
ShowTime Cinemas is extremely happy to inform that Digital Content Hard drives for Romantic Family Drama "Srinivasa Kalyanam", starring Nithiin and Raashi Khanna reached theatres yesterday along with KDMs and Premiers will be screened at the scheduled 130 locations throughout USA Today. Srinivasa Kalyanam promises to have an impressive moments of life along with ample entertainment, emotions, family drama that is supported by great background score and backed by rich production values. Early reports from the industry circles predict that it is a blockbuster in waiting. 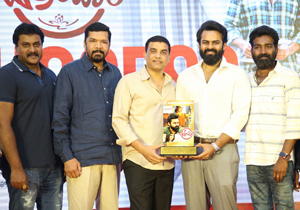 "Dil Raju" is extremely confident about the film's success and the response received from those who watched the special screening of the film has been very positive. Nithiin and Raashi Khanna played the lead role in the film. Their on screen pairing has been a treat to watch. Srinivasa Kalyanam stars Prakash Raj, Nanditha Swetha, Aamani, Jayasudha, Rajendra Prasad, Naresh and Giri Babu who can be identified with characters we come across in real life. Srinivasa Kalyanam is directed by Satish Vegesna who delivered a blockbuster and National Award Winner in 2016 - Shatamanam Bhavati is set to repeat his magic again. Produced by Sri Venkateswara Creations, Srinivasa Kalyanam promises to remain in your hearts forever - just like Bomarillu did 12 years ago on this very date. Marriage is an integral part of our Telugu culture. Srinivasa Kalyanam - It's Not An Event...It's A Beautiful Moment promises to relive the experience and rekindle the memories that all of us have experienced in real life in different roles. We have secured few XD screens in cities like Novi, MI, Plymouth, MN, Cary, NC and few more. Bring your families along and enjoy the movie in the best theaters near you! CLICK HERE!! for the Theaters List. "Geetha Govindam AT&T Offer - Buy 1 Get 1 Free"
"Sailaja Reddy Alludu Overseas by LATelugu"